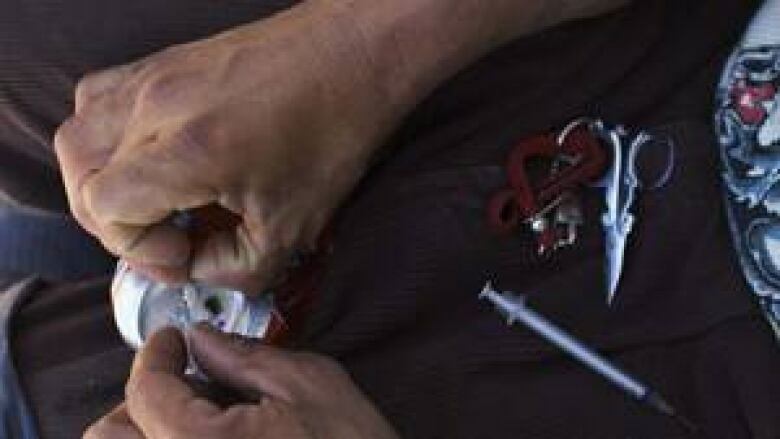 Researchers find a possible link between heavy use of methamphetamines and schizophrenia. Researchers have found a possible link between heavy use of methamphetamines and schizophrenia. Increased risk of the mental illness was discovered in meth users in a study of California hospital records for patients admitted between 1990 and 2000 with a diagnosis of drug dependence or abuse. Scientists at Toronto's Centre for Addiction and Mental Health compared the drug users to a control group of patients with appendicitis and no drug use. The hospital records were studied for readmissions for up to 10 years after the initial admission. Co-author Russell Callaghan says people hospitalized for meth who didn't have a diagnosis of psychotic symptoms at the start of the study period had about a 1.5- to threefold risk of being later diagnosed with schizophrenia, compared with groups of patients who used cocaine, alcohol or opioid drugs. The increased risk was similar to that of heavy users of cannabis, he said. There were 42,412 meth users in the data. The study was published online Tuesday in an advance edition of the American Journal of Psychiatry. "We really do not understand how these drugs might increase schizophrenia risk," said Dr. Stephen Kish, head of CAMH's Human Brain Laboratory. "Perhaps repeated use of methamphetamine and cannabis in some susceptible individuals can trigger latent schizophrenia by sensitizing the brain to dopamine, a brain chemical thought to be associated with psychosis," he said in a release. The study is the first to show a potential link between heavy use of methamphetamines and schizophrenia, and the researchers cautioned that the results need to be confirmed through follow-up studies. "Schizophrenia can be a difficult diagnosis to establish, especially in chronic methamphetamine users, and clinicians need to be vigilant in monitoring their substance-abusing patients for signs of a developing persistent psychotic condition," the paper said. In July, Callaghan and others had another study published in the journal Drug and Alcohol Dependence. It found that abuse of meth and other amphetamine-like stimulants was associated with a greater risk of developing Parkinson's disease. Meth and other amphetamine-type stimulants are believed to be the second most widely used class of illicit drugs in the world. They speed up the mind, there's a euphoria and a rush and a feeling of pleasure when using them, Callaghan said in an interview at the time. During withdrawal, there can be a negative mood and tiredness.